World of Goo Game Review - Download and Play Free Version! 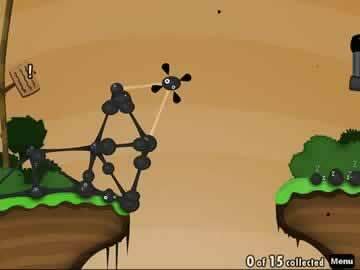 Engineer Ingenius Towers and Structures and Save the Goo in World of Goo! What do you do with a pile of goo? Build stuff with it, of course! This friendly goo sticks together so you can create towers, bridges and much more! In this mind-bending puzzle game, the goo wants to get to the pipe so it can escape, but the pipe and the goo are often separated by long stretches of empty space above goo-destroying swamps or other tough obstacles. That's where you come in! You must use the goo to build structures so that more goo can climb on to get to the pipe-but mind your physics! The problems come in when wind and gravity take control of your structures, or if you've used too many gooballs to build the structure that you don't have enough left to fill your quota of goo to be saved to win the level! Luckily, on some levels there are pink balloons that lift structures or green gooballs that can be pulled out of the structure again. Face all sorts of challenging set-ups from narrow vertical passageways to windmills that destroy goo to towers that must reach way into the sky. Can you engineer incredible structures using only a little goo? This game will challenge you to think, reason and be extremely creative. Levels become increasingly more challenging but they're so rewarding to complete. The cute touches added to this game like the Sign Painter with his witty comments and the unique graphics make this game the full package of unbeatable fun! Go save some adorable goo now and build the best structures in World of Goo! World of Goo is a thrilling puzzle game in which you use wide-eyed balls of goo to build all sorts of structures that will allow them to reach a pipe and be collected. Levels are incredibly diverse and different throughout the game. One level has you build a bridge that is surrounded above and below by spikes. You must use balloons to keep the bridge from falling into the spikes underneath, but too many placed in the wrong spots and you risk hitting the spikes above! Another level has whatever you build continually tumbling over in a giant dryer-like device. There are any number of obstacles and unique aspects to all of the levels that will keep you guessing and on your feet. The levels aren't the only thing that is diverse. The goo balls you need to collect come in various colors and looks with their own unique properties. There is goo that will act as balloons and lift your structures, or matches and spread fire. Some goo can only be placed once, while other goo can be placed and replaced. There are a surprising large number of goo types slowly introduced whose unique properties are required to complete the levels. The wide variety of levels and goo type means that even though you're doing basically the same thing for every level (building toward a pipe), it will feel new and different every time. Additionally, you can replay levels over and over to try and better the number of goo you collect, the number of moves you took, or the time the level took to complete. Goo collected during levels can be used in free-building in the World of Goo Corporation mode. Use the goo to build a tower as tall as possible and compare to others across the world. These give a great reason to replay the game and levels several times over. 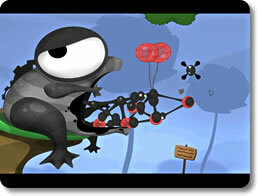 World of Goo is quite easy to pickup and play, but very difficult to master. Fortunately, even less experienced puzzle players will have some help. Signs located on every level will often contain some sort of hint or tip to help guide you. There are “Time Bugs” that can be clicked to undo moves if you mess up (which can happen quite often thanks to the wobbly nature of the goo). If all else fails, you may also have the option to skip the level completely (but the number of skips is limited). There are also many points during the game in which you'll have the choice between two different levels, so if you're having trouble or stuck on one you can move to the other. Gameplay in World of Goo is rather simple and straightforward. Simply click and hold the ball of goo you want, then release it in the right spot to build. While it is quite easy to do, sometimes actually getting the goo you want can be a challenge. Goo is continuously moving around the structures you build, overlapping each other and previously placed goo. It's also not a very quick process, which can hinder you on levels or in situations where moving quickly would be better. World of Goo even has a story of sorts. It's easy to miss, especially if you ignore the signs littered throughout levels. It's split into five different chapters and influences the design or layout of levels you play through. 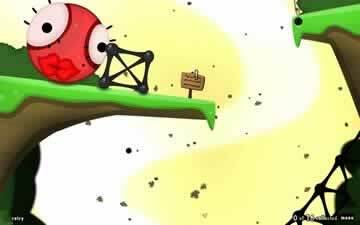 For example, one level's obstacles are explained by a sign to be a filtering system to let in only the best goo. Occasionally, there will be a cutscene with another part of the story played. The story itself matters little when it comes to playing the game, but does add an interesting element for the more dedicated. Visually, World of Goo is a very dark game with a cartoon feel to it. There's even some humor in the comments found in the game from the mysterious “Sign Painter”. The level designs consist of all sorts of pipes, spikes and other madness as well as the goo balls themselves come together perfectly to contribute to this dark and funny feel. The music fits very well with the different levels and situations, peppered with the popping and plopping sounds of the goo balls as they are placed or pop. World of Goo is an excellent game that anyone could play and everyone would likely enjoy. Forgiving gameplay means that even if you aren't a great puzzle player you'll do well. Diverse levels and the ultimate freedom and flexibility keep gameplay fresh. High scores and building up your tower in the World of Goo Corporation mode give you a reason to play over and over again. What few minor flaws the game has pales in comparison to the rest of the game and overall quality. Truly a must play. Check out the excitement of playing with goo as you build your way through the World of Goo.